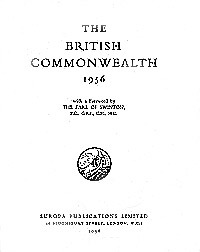 The British Commonwealth 1956 was the first edition of this most useful book about the community of nations headed by Queen Elizabeth II. These included Pakistan. In view of the historic importance of the material presented at that time, and due to the fact that it is very difficult to obtain now, we are preserving on this website the sections of the book relevant to Pakistan. Spellings have been Americanized for convenience of modern readers. See the list of contents on the left for what is available. With a Foreword by The Earl Of Swinton, P.C., G.B.E., C.H., M.C. By the Rt. Hon. the EARL OF SWINTON, P.C., G.B.E., C.H., M.C. Secretary of State for the Colonies 1931-35; Secretary of State for Commonwealth Relations 1952-55. THE compilers and editors of The British Commonwealth are to be congratulated on their courage and their achievement. There is a mass of literature about individual countries of the Commonwealth - and about particular subjects touching the Commonwealth as a whole. But there has never been, so far as I know, an attempt to combine in a single volume the story of Commonwealth development and an account of every country, great and small, within this vast and varied Commonwealth of Nations. I imagine the attempt was not made because the task appeared too formidable. That it was well worth while to try I have no doubt. I have often felt how useful it would be to have what I may call a comprehensive "Guide to Knowledge" covering the whole Commonwealth. Now we have it. It would be impossible in such a volume to tell the whole of truth. But there is a lot of interesting and useful information about every country; and the reader is put on the track how to get more special and detailed knowledge. The editors have been fortunate in obtaining the collaboration of men and women in different parts of the Commonwealth. They write with a special knowledge and understanding of their own countries. This greatly enhances the value and interest of the book. It also typifies the diversity and the unity of this unique family of nations. A work of reference is an organic body, which cannot easily be built in a day. Each edition provokes new ideas, criticisms and suggestions, from both contributors and readers, on which the editors can draw for the preparation of the next; each entry in an old edition serves as a proof for the revised entry which will appear in the new; and it is only in collecting information on new organizations or changing circumstances that fresh ground is broken. As the years go by, the reputation of the book becomes its capital; as each new edition appears its sponsors, while hoping that it will be even better received than its predecessors, are at worst comforted by the knowledge that much of it is already well tried. There is no such comfort in the first edition. Like all first editions, THE BRITISH COMMONWEALTH is a venture and the story of its production one of trial and enterprise. The story began several years ago when the directors of Europa Publications were considering whether they might make any addition to their list of international reference books, and when they decided that there was enough interest in the British Commonwealth, and enough demand for detailed information on the various countries and territories which belong to it, to justify a reference book devoted specially to it. And so the gigantic task of collecting, sorting and correlating information, began. The information is of two kinds. There are for each country or area articles on geography, history and economic conditions, most of which are written by experts in their respective fields who are either nationals of the country concerned or who know it well. Many of these articles are signed and therefore give the views of their authors. If there are inconsistencies, if the articles contradict each other, in matters of opinion, or stress different aspects of their subjects, the editors offer no apology. The object is in every case to give an interesting and authoritative view rather than to aim at text-book uniformity. The British Commonwealth is a loose, illogical and complex association of peoples which defies any attempt at rigid treatment. The sections on the constitution, government, administration, legal and religious affairs of each member of the Commonwealth, and those on many aspects of their national and international life which follow, consist almost entirely of facts-detailed information, as accurate as we can make it-about many thousands of institutions and organizations. In presenting this category of information, the problems vary with the country or territory: in the case, for instance, of the United Kingdom or Canada or Australia, selection was the great difficulty; in the case of some of the more remote or smaller territories, collection; and in yet other countries-particularly in parts of Africa-political and commercial development is so fast that information is often outdated while it is going through the press. There were many other problems. The choice of title seemed at first to be easy enough. We decided quite spontaneously on THE BRITISH COMMONWEALTH as being the most straightforward description of the contents. But when the book was well under way we were asked to consider THE COMMONWEALTH or THE COMMONWEALTH OF NATIONS as possible alternatives. The suggestion came from a friendly and responsible quarter and we therefore considered the question of the title in all its aspects. We decided for what we believe to be good reasons (including the fact that the Commonwealth might be confused with the Commonwealth of Australia and The Commonwealth of Nations taken to mean all the nations of the world or the members of some future world organisation) that our original choice was best. There were also of course, endless minor difficulties and decisions such as beset every work of reference, but that so many of the problems have been solved and in fact that this book appears at all is due to the help of people in all parts of the Commonwealth. Before all of them we must thank our two advisory editors. Professor GERALD S. GRAHAM, Rhodes Professor of Imperial History at King's College, University of London, who contributed the first chapter of the book and who organized the historical sections; and Dr. W. B. FISHER, Head of the Department of Geography, Durham Colleges, University of Durham, who contributed -several of the geographical sections and commissioned and supervised the rest, and the maps. Both of them have been ready at all stages to answer queries and to give advice, and have been most patient with our difficulties. H. A. ALAVI, former Secretary, State Bank of Pakistan. F. H. ANDREASEN-AALEN, Hatfield College, Durham. J. H. APPLEBEY, Leader Writer on the Daily Telegraph. H. BOWEN-JONES, Lecturer in Economic Geography, Durham Colleges, University of Durham. Professor A. BRADY, Department of Political Science, University of Toronto. A. C. BUCKLEY, former Demonstrator, Department of Geography, Durham Colleges, University of Durham. Sir CHARLES COLLINS, C.M.G., late of the Ceylon Civil Service. C. D. COWAN, Lecturer in History, School of Oriental and African Studies, University of London. J. C. DEWDNEY, Lecturer, Department of Geography, Durham Colleges, University of Durham. Dr. K. ONWUKA DIKE, Head of the Department of History, University College of Ibadan, Nigeria. Dr. R. Dow, I.C.I. Ltd., former Research Fellow of the University of Aberdeen. Miss ETHEL DRUS, Lecturer in History, Birkbeck College, University of London. Dr. H. S. FERNS, Senior Lecturer in Modern History and Government, University of Birmingham. J. F. FLAHERTY, of Buchanan's Bulletin, Ottawa, Canada. H. A. DE S. GUNASEKERA, Lecturer in Economics, University of Ceylon. Dr. A. J. HANNA, Lecturer in History, University of Southampton. J. H. HUBBARD, Former Lecturer, Department of Geography, Durham Colleges, University of Durham. Professor ARTHUR KEPPEL-JONES, Department of History, University of Natal. A. D. KNOX, Lecturer in Economics, London School of Economics. Miss HILDA LEE, Lecturer in History, London School of Economics. D. H. MALING, Lecturer, University College of Wales (Swansea); former member of the Falkland Island Dependencies Survey (1947-50). Professor NICHOLAS MANSERGH, Smuts Professor of the History of the British Commonwealth, University of Cambridge. P. K. MITCHELL, Demonstrator, Department of Geography, Durham Colleges, University of Durham. Professor C. G. PHILIPS, Department of History, School of Oriental and African Studies. Professor V. K. R. V. RAO, Head of the Delhi School of Economics. E. J. TAPP, Senior Lecturer, Department of History, University of New England, N.S.W., Australia. C. H. THOMPSON, Department of the Prime Minister, and Cabinet Office, Central African Federal Government. I. B. THOMPSON, University College, Durham. J. S. G. WILSON, Reader in Money, Banking and Public Finance, London School of Economics. B. J. P. WOODS, Editorial Staff of The Economist. After that, it is difficult to know where to start or where to stop; but we should like in particular to thank Mr. C. C. WIGLEY, of the Institute of Commonwealth Studies, for his help with the East African Economic Survey; Mr. B. C. HARFORD, of the Commonwealth Bank of Australia and Mr. H. R. WOODROW, economic adviser to the Australian Treasury, for their help at the proof stage with the Australian economic and statistical surveys; and Mr. D. SIMPSON, Assistant Librarian of the Royal Empire Society for his help with the book list. The rest of our thanks must be anonymous, because they go to the many hundreds of individuals in all the parts of the Commonwealth who have answered our letters or questionnaires, checked our drafts or suggested how this or that subject might be treated. These include officials in the offices of the High Commissioners and Commissioners in London and officials in overseas governments, many of whom have taken far more trouble than we had any reason to expect to give us up-to-date details, to check statistics, to encourage and advise; and the secretaries, librarians or Public Relations Officers of the many banks, insurance companies, trade organizations, transport offices, societies, institutes, libraries, museums, colleges and other organizations of which details are given in this book. They have gone out of their way to help us, often, we know, at the cost of much time and trouble, and we are glad to have this opportunity to show our very deep appreciation of their support. We hope too that they will find this volume useful and, in the course of time, let us have their comments and criticisms before we embark on the second edition. In compiling the book we have had them particularly in mind and we should like in future editions to adapt it as far as possible to their needs; and indeed to the needs of the intelligent citizen in every country who wants concise, dependable information about a unique experiment in international co-operation involving over a quarter both of the land area of the globe and of the world's population.